In the past 5 years charity games have been organised in Daventry, Northants. Organsied to promote local and national charities, and local causes. These games have primarily been organised by Terry O'Neill, who has driven each event with a team made up of family, friends and volunteers. Football FC was founded in 2012 and draws on the experiences of the past to improve and become a major player in promoting charities, whether local or national. Local causes are also helped by raising money for family's with financial problems with hospital fee's or distance commuting to see or support loved one's in hospital. In the past we have aided 24 different charities and causes, raising £90,000 in the process. 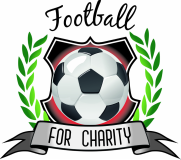 FOOTBALL FC is hoping to raise in excess of £100,000 for charities in 2014. Please read through our pages to see about our events past and present. Read about the charities we have supported in the past and the charities we will support in the future. Find through the pages our Sponsorship and Advertising opportunites (our programmes are immense). Our previous and current Sponsors, our business partners, Meet the Trustees, read Testimonials on previous events. See how you can help in future events. It's all here and any feedback is gratefully received. If you wish us to do a game for you then please contact us asap. Manchester United Legends that played local United fans in Daventry in May 2012. The picture includes 3 local players who raised the most sponsorship to play against them. Local United fans who played against the Legends in May 2012. These guys played the first half of the match. FOOTBALL FC was formed on October 26th 2012.